Squeeze enough lemons to make ¾ cup lemon juice. Simmer it together with lemon zest, ¾ cup sugar, a stick of butter, 2 tablespoons of cornstarch, and salt. Beat 4 egg yolks, add to the mixture and cook on low heat for a minute. 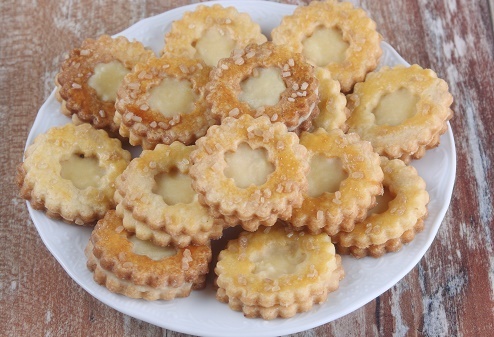 With your lemon curd ready, you can use it as a topping on any butter cookie.